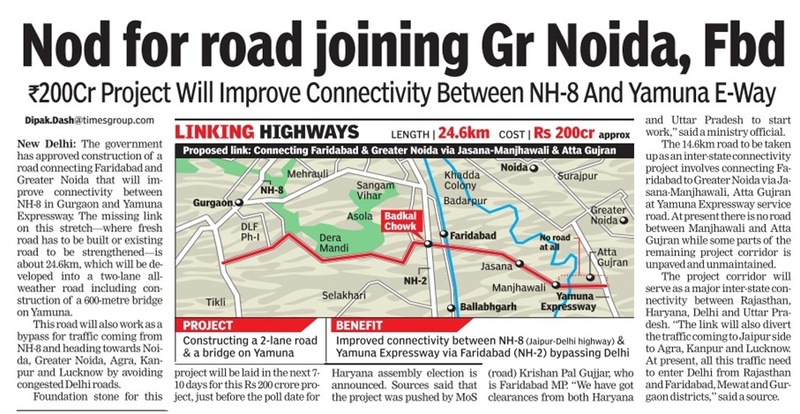 NEW DELHI: Government has approved construction of a road connecting Faridabad and Greater Noida that will improve connectivity between NH-8 in Gurgaon and Yamuna Expressway. The missing link on this stretch—where fresh road has to be built or existing road to be strengthened—is about 24.6 km, which will be developed into a two-lane all-weather road including construction of a 600 meter bridge on Yamuna. This road will also work as a bypass for traffic coming from NH-8 and heading towards Noida, Greater Noida, Agra, Kanpur and Lucknow by avoiding congested Delhi roads. Foundation stone for this project will be laid in the next 7-10 days for this Rs 200 crore project, just before the poll date for Haryana assembly election is announced. Sources said that the project was pushed by MoS (road) Krishan Pal Gujjar, who is Faridabad MP. "We have got clearances from both Haryana and Uttar Pradesh to start work," said a road ministry official. The 14.6 km road to be taken up as an inter-state connectivity project involves connecting Faridabad to Greater Noida via Jasana-Manjhawali, Atta Gujran at Yamuna Expressway service road. At present there is no road between Manjhawali and Atta Gujran while some parts of the rest portion of the project corridor is unpaved and unmaintained. The project corridor will serve as a major inter-state connectivity between Rajasthan, Haryana, Delhi and Uttar Pradesh. "The link will also divert the traffic coming to Jaipur side to Agra, Kanpur and Lucknow. At present, all this traffic need to enter Delhi from Rajasthan and Faridabad, Mewat and Gurgaon districts," said a source. With the completion of this project, agricultural product of nearby villages can easily be transported to UP and Haryana without crossing Delhi. Presently, people face greater difficulty as they have to take boats to cross the river. Officials said that the project will also boost real estate activities along the corridor.